SHARING : If you like a post so much (I hope I’m able to create such good content) and want your friends to read it too, simply click any of the social media icons to INSTANTLY share it. SHOPPING LINKS : Although most of my clothes are gotten from thrift stores, I’d try my best possible to include shopping links to similar pieces at very low prices so we can all be fashion twinnies. SHOP MY CLOSET : From time to time I’d update this section of DRAPED IN BASICS with items I’d like to sell from my closet at the lowest prices you can’t even begin to imagine right now. If you want to be the first to know when there is a new item in the shop, hurry and subscribe to my newsletter, you definitely won’t regret it. YOU MIGHT ALSO LIKE : This I’d be curating personally to help you get inspired by similar posts and also to help you discover new tales about basic stuff I’m loving. I’m really happy I’ve finally gotten to this stage but I’d never have accomplished this without the help of the amazing people at STYLVO, my friends, you my amazing blog reader and especially my photographer Seun. I’d definitely be adding a whole lot of other new features and continuously working on this website to make it an enjoyable journey for us all. What do you think of my new name and blog theme? What kind of post would you like to see in this new phase? Do leave a comment, thanks. I’m super glad you like the name!!!! Thanks darling, I appreciate you being here!! Wow!this is so inspiring. I am so happy you took this step on your blogging journey. Love it baby girl! Well done!!! Amazing! This is so inspiring. Congratulations on taking a new step on your blogging journey. Love your new name and new layout too. Scary new step it was but I’m glad I did it. Even happier that you like it. Well done girl. Congrats on the new site and love the new name. Baby girl I’m so happy for you RN, I woke up to see and it brought a smile on my face, continue to grow in God’s grace Ifeoma. Thank you so much for your continuous support, I appreciate you loads!!! Hahahaha it’s going to be a lituation Hassie, just wait till I start uploading pieces for sale. Yay thank you so much Jennifer, I really do appreciate your comment. I’d do my best as always!!! Love the new theme and name. Well done! Thank you so much Unoma!! Thank you so much Adaora, I hope I’m able to and I wish you same too!! But I guess there isn’t much difference. It’s the same blogger…….so it’s the same inspiration we got on whowhatfab that’s going to be seen here too. Congrats Ifeoma on this New journey. Awwwwwn Gift!!!! It’s just a name change, I’m sure you’d love drapedInbasics too. You did a good job. Love it, most especially the shopping tab👏 well done. Whoop whoop! Cheers to the next step. I’ve actually been waiting for this to happen. Guess it’s time to update my bookmark colum to the new Draped in Basics. And yes! This name suits you well! Congrats dear. Ok!!! This is what I’m here for Ifeoma. You’re steady inspiring me to up my game and I appreciate you for that. The new name is amazing and I hope I can come up with something great too when I decide to own my website. Congrats baby girl!!! I’ll definitely miss Who What Fab – I think that’s an amazing thing that a name generator came up with that, and look what you did with it! Well, you can only continue to grow and glow from here. Can’t wait for the ‘shop my look’ and also sales from your wardrobe! yaaaay! I love the name girl, and cheers to us using the same theme, great minds think alike haha. I look forward to more amazing posts! Yassssssssss I loved the theme at first sight. 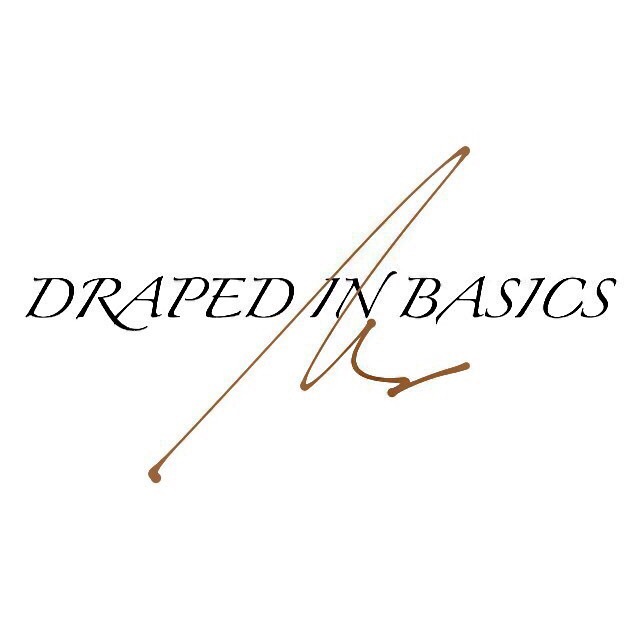 Thanks girl, I knew I wanted ‘basics’ in the name then I saw a caption on IG that read draped in silk and that was it. But bravo👏👏. And I’m already looking forward to moving some pieces from your closet. I’m happy you found a name that works! I love this new website. Weldone ifeoma. So proud of you girl !!!! So much in store for you and I can’t wait to see your platform grow !!!! Thank you so much my darling, see you soon!! Lovely. Love the new name. Kept wondering why you have not posted. I think this is really a good move. Congrats! I’m glad you took the time to come up with the new name. 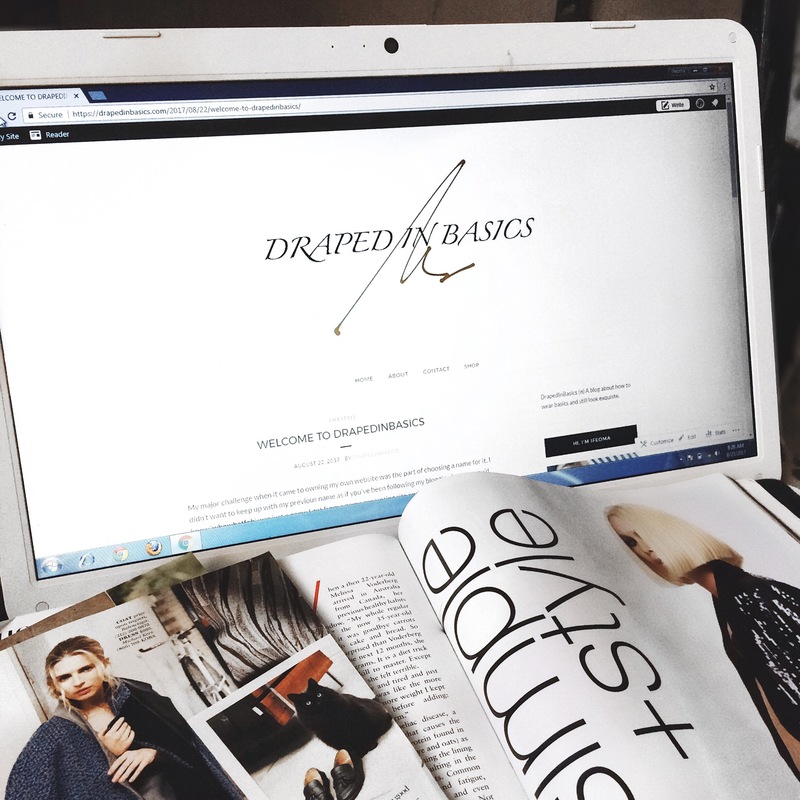 Draped in Basics is perfect and befitting your style. Congrats on the milestone. Thank you so much Phidelia!! So proud of you girl. Love the new name, the theme of the blog… in fact, I am in love with everything! I wish you the very best in this new phase of your blogging career. Thank you so much darling!!!! !